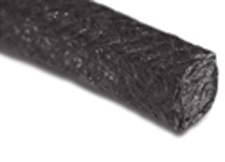 Glass fiber yarns with inconel wire insertion are lubricated, braided and then Graphite treated. Excellent heat, chemical, pressure resistant. Suitable for valves under high temperature and pressure. Mainly used in combination with JIC 4101.